TRH11319880220001 BOA CANOPUS som STAR CANOPUS. Foto: Yves Perchoc. Smiths Dock Ltd., Middlesbrough, England. 2.850 tdw, 2.926 brt, 1.022 nrt. Loa: 82,2m-Lbp: 73,6m-B: 17,5m-D: 7,0m-Dypg. : 5,014m. 2 dieselmotorer, Polar SF112VS-F. Hver 4-takt/enkltv., V12-sylinder, syl. dim. : 250 x 300 mm. Samlet 4.620 BHK giret til 2 vribare propeller. Bygget av British Polar Engines Ltd, Glasgow, Scotland. 13,0 knop. Bunkerskapasitet 193 t.
3 dieselgen., hver 500 kW. 1 dieselgen nød 123 kW. Bygget som STAR CANOPUS av Smiths Dock Ltd., Middlesbrough, England for Star Offshore Services (Supply Boats), Aberdeen, Scotland. 1976 Sjøsatt 18/03, levert 21/05. 1981 Solgt til Royal Bank of Scotland, Hong Kong. Omdøpt til SUB SEA CANOPUS. 1988 Solgt til Boa Ltd (Taubåtkompaniet A/S, Trondheim), George Town, Cayman Islands. Omdøpt til BOA CANOPUS. 1994 Ommålt: 2.850 tdw, 3.441 brt, 1.032 nrt. 1996 Navigare International Inc., George Town ble managers. 1998 Solgt til Ocean Oil Construction & Services Ltd (Navigare International Inc.), George Town. 2018 Fremdeles i bruk 03/09. Built as STAR CANOPUS at Smiths Dock Ltd., Middlesbrough, England for Star Offshore Services (Supply Boats), Aberdeen, Scotland. 1976 Launched 18/03, delivered 21/05. 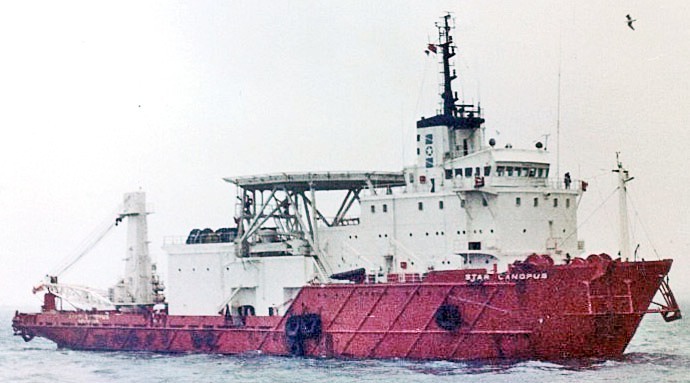 1978 Converted to a diving support vessel. 1981 Sold to Royal Bank of Scotland, Hong Kong. Renamed SUB SEA CANOPUS. 1988 Sold to Boa Ltd (Taubåtkompaniet A/S, Trondheim), George Town, Cayman Islands. Renamed BOA CANOPUS. 1994 Re-meas: 2.850 tdw, 3.441 grt, 1.032 nrt. 1996 Navigare International Inc., George Town became managers. 1998 Sold to Ocean Oil Construction & Services Ltd (Navigare International Inc.), George Town. 2018 Still in use 03/09.